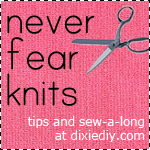 Never Fear Knits Ballet Dress Sew-a-long Begins! Whew – I had a crazy holiday but I’m back and ready for business! First thing’s first – the Ballet Dress pattern is now up for sale! I know, I know, you all love free patterns but making patterns is a lot of work! I still have many other patterns for free to download. In this post we’ll print out the pattern, prepare our fabrics, find our size and cut out our pieces. To get started print out the pattern at home. The twenty pages include instructions and sizing as well as all the pieces. When printing from Adobe Reader it is important to select “None” in the page scaling section. If you are using a different program or a different version of Adobe Reader it may not look the same as the above screen cap. Scaling will make the pages print smaller or larger to fit within the printable area on the paper. The printable area size varies on different printers so I have to make the pattern print with a white border around each page. You can check to see if the pages printed correctly by measuring the Test Square. To arrange all the printed pages you’ll need scissors and tape. The pages line up like a grid with four columns and five rows. The numbered notches go across and the letter notches go vertically. Trim the borders of pages if needed to match up the notches. Tape. Before we start cutting let’s prepare our fabric. I’m using two types – a sweater knit on top (look! deer! or are those mooses? what’s the plural for moose, anyway? ), and a plain medium weight black jersey for the skirt. Wash your fabric according to fiber type. Remember, knits fabrics have a tendency to shrink so pre-washing is important! Once dry, iron if needed and lay the fabric out flat on a table so it won’t stretch out. Now, back to the paper – In this pattern I’ve included finished garment measurements. Why? Because knits patterns for fitted designs are different than woven patterns because they have much less built in ease. The nature of knits means that the fabric stretches over your body (which is why you don’t need darts and zippers). I like using finished measurements as a guide because it allows you to pick the amount of ease you want for your dress. Pick the size closest to your actual measurements or whichever size is larger. Just like with woven patterns, if you are between sizes in certain places you can combine sizes at different points. Say you’re measurements are 40/28/39. You can cut a L in the bust, glide down to a M in the waist and cut a M size skirt. If there is any place you want to be larger than your body measurements (or extra ease) it would be in the hips because the skirt is looser fitting than the bust or waist. Now that you have your size you can cut out your pieces. If you want to shorten or lengthen the skirt, bodice or sleeves you can slash and spread at the gray lines printed on the pieces. You can even make the skirt looser fitting by swinging out the side seam line and continuing the hem curve. If you normally need to do a full bust adjustment on patterns then you’re in luck. Because knits are stretchy you might be able to get away without one. Try making a muslin of just the bodice. If it feels tight across the bust or if you’re getting wrinkles you might want to try an FBA. FBAs on knits are similar to woven patterns but they have no darts. An FBA will look something like this where the pink lines are cutting lines and the blue lines are where you draw new lines to smooth everything out. Remember, the length of the side and waist seams need to match up with the back bodice and skirt waist seams. Finally, after all that we can cut out the fabric pieces! The pattern includes cutting layouts but because I’m using two different fabrics my cutting layout might look different than yours. Remember to use weights, a rotary mat and cutter (I use jars of buttons as weights, or whatever I have close by). You can use pins and shears but be careful not to accidentally stretch your fabric. ***Ok, I think that’s enough prep work for one day. Tomorrow we’ll start with the basics – sewing bodice and skirt pieces. Then we’ll do waist and sleeves followed by hems and collar. Easy peasy! Probably the shortest sew-a-long ever but it isn’t a difficult pattern design.